The annual extravaganza of RM Auctions’ Sports & Classics of Monterey classic car auction always presents a droolworthy catalogue of beautiful and dramatic cars, but this year they’ve outdone themselves. Meet my next Christmas present (the perfect companion to that Bugatti Royale you guys are getting me for my birthday), the 1949 Delahaye 175 S Saoutchik Roadster, custom built by industrial engineer Emile Delahaye and coachwork artist extraordinare Jacques Saoutchik for car show enthusiast Sir John Gaul. After the war, Delahaye introduced a brand-new design, the 175, a four-and-a-half liter six-cylinder design based on a new block with a seven-bearing crank. Output ranged from 140 bhp to 185 bhp for the sport models. It was Delahayes first left-drive chassis and was planned to compete with the Lago Record. The chassis was also state-of-the-art, featuring a Dubonnet front suspension and a De Dion rear axle with drive-shafts passing through the side rails of the frames. The brakes were hydraulic, with twin master cylinders and finned alloy drums. The gearbox was an electromechanically actuated unit by Cotal. Jacques Saoutchik is the reason it looks so gorgeous with those dramatic swooping lines, the fully skirted fenders that apparently make it look like it’s floating when it’s in motion, and that gorgeous graphic interior with the Lucite steering wheel. There are no other Delayhayes like this one. Saoutchik’s work was too expensive to sustain in the lean postwar years, even with the revival of the wealthy car enthusiast concours circuit. The firm ended up closing up shop in 1955, just 6 years after they made the most beautiful Delahaye of all time. Sir John Gaul showed it with much success for 5 years before selling it to British actress Diana Dors, aka ‘The British Marilyn’. Turquoise was apparently her signature color. She kept it for a couple of decades, then the car went through some tough times. Parts were replaced that shouldn’t have been replaced. It wasn’t until 2007 that this precious humpty dumpty was put back together again with the original parts, and now it’s for sale. Estimated price: just $4,000,000 to $6,000,000. That’s a bargain compared to the Turner you all disappointed me deeply by not buying for me. If you like looking at purty vehicles, the whole catalogue is a must-browse. It’s one gem after another. 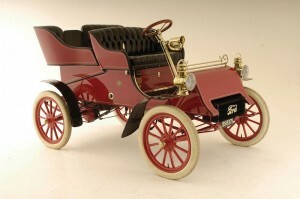 My second favorite is the 1903 Ford Model A Rear Entry Tonneau (estimate $600,000 – $800,000). This is the oldest model of Ford surviving, and this particular car has had, count ’em, FIVE owners since 1903. This entry was posted on Wednesday, August 11th, 2010 at 11:12 PM	and is filed under Modern(ish), Treasures. You can follow any responses to this entry through the RSS 2.0 feed. You can skip to the end and leave a response. Pinging is currently not allowed. In any case: cutest horn ever. Dang, if I’d have known I could have got it for $3m, you’d be driving that baby right now, liv. Rotten luck. So close. So close and still so faraway.